Golf is a great way to spend the day once you know the basics of play. 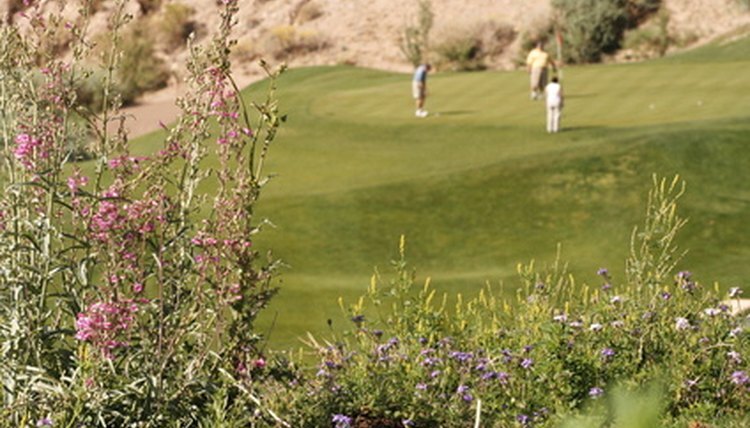 Golf is a recreational sport that is enjoyable for all ages, from small children to seniors. Before jumping right in and playing, it is important for a player to understand the basics of the game. By ensuring you understand the basics of golf's goals and rules, and the base keys to a successful swing, you can ensure the most enjoyable day. When playing golf, the objective of every golfer is to get the ball from the tee box and into the hole in as few strokes as possible, meaning that player who scores the lowest in a round is the winner of the round. The first shot on every hole is hit off a tee, but all future shots must be played where they lie at the conclusion of the prior shot until the ball is on the green. Once a player has gotten onto the green, the closely cut grass around the hole, he is permitted to place a marker down where his ball rests and pick the ball up, either to clean it or to prevent it obstructing another player. All strokes played are equal, with each counting for one stroke toward the player's total. Unlike other sports, where there is a referee or umpire to find infractions by players and enforce the rules, and a penalty that goes uncalled is viewed as a lucky break, golf relies on players to call penalties on themselves. While some penalties, such as a lost ball, which calls for the player to replay her ball while taking on a penalty stroke as well, are obviously apparent to all players, there are less-apparent penalties, such as the two-stroke penalty for grounding a club in a bunker before the swing process, which can escape the eyes of playing partners. In these instances, it is considered very poor sportsmanship not to call the penalty on yourself. While perfecting a golf swing takes hard work, by following the basics of the swing, players can at least have an enjoyable experience in their first rounds and minimize the chance of succumbing to frustration. The player should always align square if trying to hit a straight ball, meaning the club face is pointed at the target, and the player's hips, shoulders and feet are all pointed parallel to the same line. The golfer then swings the club by using his shoulders and hips to generate the backward and forward momentum. A common error is to swing with the arms, but by turning from the shoulders, the arms will naturally bend and straighten appropriately throughout the swing process.